You're trying to figure out where to live — let's help you figure out the best neighborhoods in Boston for you. If you're looking for the best places to live in Boston for your unique preferences, you'll want to find the areas at the intersection of your lifestyle, your commute and your budget. A great place to start is with Jumpshell's Boston Neighborhoods web app, but we'll also enumerate some other insights on how to determine where you might want to live in Boston, as well. Full disclosure, if you're looking for a weird (mostly useless) "Where should you live in Boston?" quiz that asks you what your favorite dog is and then spits out a neighborhood — you're in the wrong place. For those of you who just can't wait, here's the list of top 10 neighborhoods in Boston for young professionals (in no particular order!). Read on to get all the details on Boston's neighborhoods! Step 1: Understand your "odds" of finding an apartment in different neighborhoods. This step is definitely a "research phase" activity. You're just getting yourself acquainted with what prices and availability look like in different neighborhoods in Boston. The tool below breaks down neighborhoods in the Boston area by price and availability of apartments. Since it's already a grind to find good data on apartments in specific neighborhoods, we only feature neighborhoods where we have rock-solid information (that's why you'll see a limited selection of neighborhoods). If you're on a mobile device, try viewing this tool horizontally for better results — it's definitely not perfect, but we're working on it! Step 2: Find neighborhoods that match your commute and lifestyle preferences. Now we're getting into the fun stuff! Being able to afford a specific neighborhood is only part of the battle — enjoying where you live is important too. We noticed that many people looking for apartments in Boston have to combine Google searches, blog posts, advice from friends, reddit and Quora to figure out what neighborhoods they might like to live in. Parker, one of our talented software engineers, built our Neighborhoods Browser to combine all of that information into one intuitive place. Our neighborhoods tool aggregates relevant data from WalkScore, Foursquare and other resources to cross-reference your commute with your preferred neighborhood amenities and give you a detailed, beautiful display of Boston's neighborhoods. We even considered that the neighborhood boundaries in Boston are perceived differently by residents. Try out our Boston Neighborhoods web app to find the best places to live! Here's a screenshot of the web app — browse neighborhoods by commute time, by neighborhood amenities, and median rent prices. 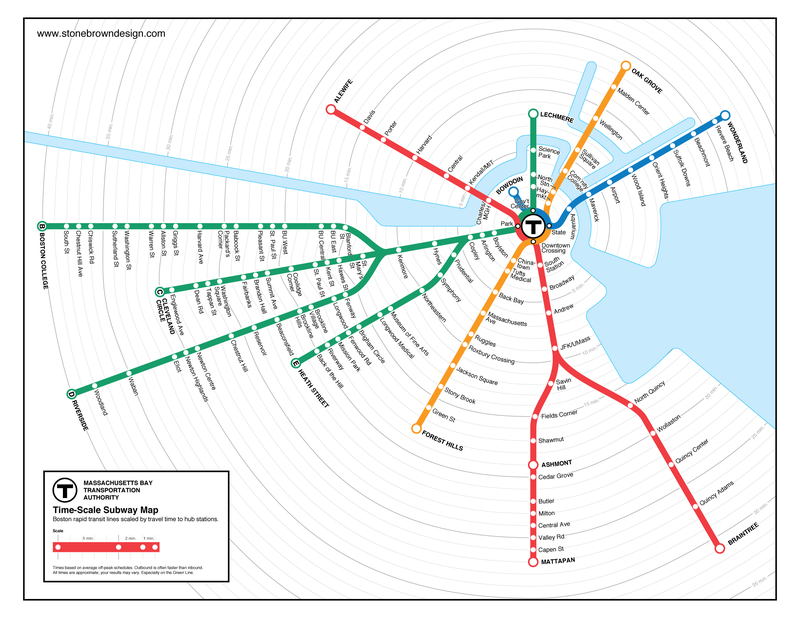 ...check out this awesome graphic from Stonebrone Design that shows the commute time to different T stops from Downtown Boston. With 80 percent of young professionals considering access to public transit as “very important” when choosing a place to live (source: WBUR), this map may be most relevant to young professionals moving to or living in Boston. We've also put together a more static, research-based list of popular neighborhoods in Boston for young professionals and graduate students. Obviously, this list will be far more generic than the results you'll get from the Neighborhoods Browser, which tailors your neighborhood search experience based on your personal circumstances. The list is "ranked" from best on down, based on density of young people, average rent prices and a few other factors as well! Note: this list is numbered for ease of reading, not to indicate any specific ranking! Allston is Boston's housing beacon for young renters. A primarily young population (with a low overall median age), coupled with an abundance of apartments makes this town the top spot for would-be young renters in Boston. Fenway is loaded with young people, cool food joints, and bars where locals flock when the Red Sox take the plate. Very cool area and a must-look location for young people looking to rent in Boston. (Note: It was very hard not to make any “home run” baseball analogies for this neighborhood). Brighton is right next to Allston and is a top contender with nearly 75% apartment saturation and over 50% of the population between the ages of 20 and 34. Did you know? Roxbury is home to over 570 acres of parks, playgrounds, and athletic fields, the most in the city. Roxbury has over 23% of park space in Boston. Dorchester offers a variety of landscapes including 9.46 miles of waterfront, residential neighborhoods, commercial corridors, and a university campus. Mission Hill lies just south of the Longwood Medical Area and just north of Jamaica Plain in Boston. Note the incredibly high share of total housing that apartments represent in this area (88.6%). Couple that with a 48% young population and you’ve got the recipe for a great town for young renters. The student population in East Boston is surging — growing by 115% between 2006 and 2013, according to an October 2015 article in The Boston Globe. Whereas almost 50% of East Boston’s population is foreign born (the highest percentage of all Boston’s neighborhoods), this quickly gentrifying neighborhood may see a shakeup of with more students and young professionals from the States coming in. Lots of young people and a low average rent make Brookline, MA an awesome place to look for apartments as a young renter. Home to the annual St. Patrick’s Day Parade, South Boston is also a great spot to find and meet young people in Boston. South Boston has also been a filming location for notable movies like Good Will Hunting, The Departed, Gone Baby Gone and Mystic River. How did we come up with this ranking? Jumpshell defines a “young population” as between the ages of 20-34. Neighborhoods with over 10,000 people between the ages of 20-34 received 3 points. Neighborhoods with between 5,000 and 10,000 people between the ages of 20-34 received a 2 points. Neighborhoods with under 5,000 people between the ages of 20-34 received 1 point. Neighborhoods where over 70% of the population is between the ages of 20-34 received 2 points. Neighborhoods where between 50% and 70% of the population is between the ages of 20-34 received 1 point. Neighborhoods where under 50% of the population is between the ages of 20-34 received 0 points. Neighborhoods where rental units represent over 70% of total housing received 2 points. Neighborhoods where rental units represent between 50% and 70% total housing received 1 point. Neighborhoods where rental units represent under 50% of total housing received 0 points. Neighborhoods where average monthly rent was under $2,500 received 3 points. Neighborhoods where average monthly rent was between $2,500 and $3,000 received 2 points. Neighborhoods where average monthly rent was over $3,000 received 1 point. Neighborhoods with a median age below 28 received 2 points. Neighborhoods with a median age between 28 and 34 received 1 point. Neighborhoods with a median age above 34 received 0 points. We also want to extend a huge thanks to the Boston Redevelopment Authority Research Division for helping us get the young population numbers, as well as figures on the volume of rental units in each neighborhood with their Boston in Context: Neighborhoods publication. Thanks so much! I've got you covered! Jumpshell's done an in-depth analysis of the "safest" neighborhoods in Boston. I use quotations, because "safe" is always a murky term since you can't quantify safety purely on the amount of crime in an area — however, a lot of renters who reach out to me asking about safety cite crime as the primary metric they're concerned about. I sifted through data from the Boston Police Department to compile an accurate list of the safest neighborhoods in Boston. Choosing where to live in Boston gets more fun with more prepartion. If you earn $85,000/year and want to live alone, you can live wherever you want in Boston. From there, it's a bizarre calculus of geography, roommates, commute times and apartment amenities that will help you choose where to live in Boston. Luckily, I've got a few years of coaching people through this to lean on, so I'll do my best to give you the tools to choose where to live in the area. This spreadsheet will aclimate you to Boston's supernatural rent prices. I'm looking into how to make this into a usable widget, but for now you'll have to do the math on your own. I'll run you through a basic example below. A very common apartment "type" that people request is a 1-bedroom apartment that's less than 30 minutes from Downtown Boston, isn't in a basement and has hardwood floors. Nothing fancy. The average apartment that fits this profile will cost around $1,700/month. Just use the table above! That may come as a shock, which is fair because there aren't any "fancy" amenities included. It's just that Boston just has a cost-of-housing issue and it's something a lot of people struggle through. So if you're coming from any city other than San Francisco, New York or Los Angeles, you may have the stretch your budget higher for the same amenities you've become accustomed to in more sanely priced areas. Also, just a heads up that the more idyllic/postcard-candy neighborhoods (like Back Bay, Beacon Hill and the North End) are also very close to Downtown Boston — so the most coveted locations aesthetically are also the most sought-after geographically. Curses! So, here are the "dials" you can adjust in your apartment search that will affect what you ultimately pay. Proximity to Downtown Boston. Simply put, every 15 minutes of commute distance you can put between you and Downtown Boston will drop your rent by about $200/month. Not bad if you can manage a longer commute. More physical space. Bottom line, space is scarce in Boston. So if you're hoping for more space, whether in the form of more square footage in your apartment (1-bedroom vs. studio) or an off-street parking space, you'll have to pay for it. So if your budget is fixed, then the best way to get that "extra" space is to look in less expensive areas of the city, which tend to be farther from Downtown Boston. Nice/modern amenities. Very few people request "nasty, old appliances". Unfortunately, Boston's one of the oldest cities in the U.S., so a lot of buildings are full of old stuff (i.e. stuff that was modern 20 years ago). Unfortunately, most of the new buildings are "Boston luxury apartments" and older buildings that have been upated get to charge higher prices because everyone wants nice stuff. For anyone preparing themselves for the quest for the "hidden gem". FACT: hidden gems unequivocally exist in Boston. They're great. They're magical. It's like you've been sucked into another dimension where Boston actually costs as much as a normal city. I can guarantee you that there are a handful of $1,500/month studios on Beacon Hill with nice amenities. FACT: there are a handful. To be clear, that's like one for every hundred normal apartments. It's really really really hard to find them. FACT: hidden gems suffer from "revolving door" syndrome. When someone scores a hidden gem apartment, it almost becomes a moral obligation to not release it into the wild when they're ready to move out. There's an unwritten law that one who lives in a hidden gem must pass it down to their friends or family. That's actually part of the reason hidden gems exist in the first place. Landlords know they might not be maximizing profits, but they're all but guaranteed to never miss a month of rent — and probably get great tenants since they're referred by their previous tenants. FACT: really the only way to find one is through a friend. See above. Trying to just find a by-owner listing or using an agent just won't work. There's too much competition and it'll just break your heart. I don't want that!